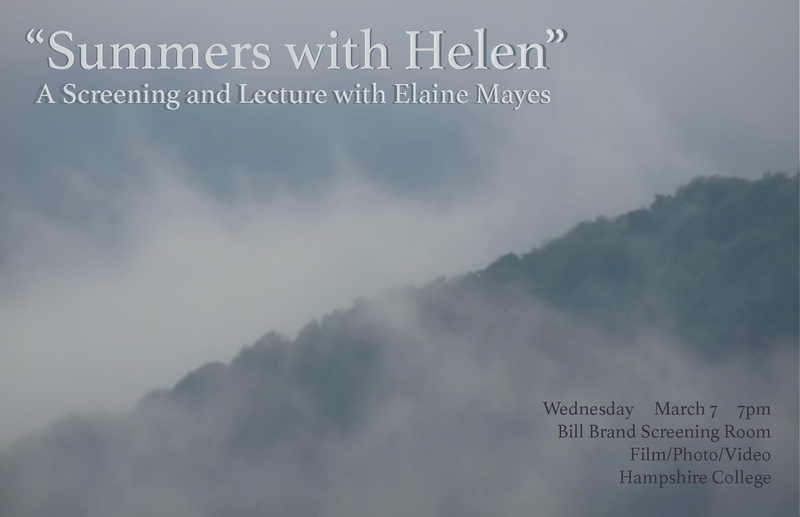 Join us in the Bill Brand Screening room on March 28th at 7pm for a screening of “Summers with Helen” and a talk by the filmmaker, Elaine Mayes. Elaine Mayes is a photographer and filmmaker who has been working with camera produced images for fifty-seven years. Her photographs have been exhibited many places including MOMA, The Metropolitan Museum of Art, The Contemporary Museum in Honolulu, the Boston Museum of Fine Art, The Smithsonian American Art Museum, The Joseph Bellows Gallery in La Jolla and The Steven Kasher Gallery in New York. Currently she lives in Denver, NY and is preparing a retrospective for The SCAD Museum of Art in Savannah, Georgia. Her books include, “When I Dance (1967), “It Happened in Monterey” (2003), and “Recently” (2015). She was on the founding faculty at Hampshire College and taught film and photography from 1971 to 1981. She also taught at Bard College and retired from teaching photography and video at the Tisch School of the Arts, Department of Photography and Imaging, New York University in 2001. Her latest film “Summers With Helen” is a conceptual documentary about two older women on summer vacations in the Catskills. One of these women is Helen Levitt (1912- 2009), a well-known artist photographer and filmmaker who was the first woman to have a one-person show at MOMA. The other is Mayes herself. “Summers with Helen” was recorded primarily inside and outside the mountain cabin rented they for six weeks each summer. The film can be seen as a meditation. It is probably the only filmic record of Helen Levitt as a person, as she hated being photographed and avoided being seen by anyone using a camera. The video is edited from ten years recording, and moves technically through the various amateur video formats available between 1996 and 2006. “Summers with Helen” also includes themes of old age and the situation of being older.